Vacationers to Bavaria had undoubtedly heard of "Garmisch", more properly known a s Garmisch-Partenkirchen, a dual-town at the base of the Bavarian Alps. It was one of the most popular resort spots for Germans, Austrians, and many other nationalities, due to its convenient location and year-round offering of things to do. It was especially popular among Americans, who since the end of World War II have had their own resort facilities in the area that catered to the rest and recreation needs of American Soldiers. Several dozen hotels, guesthouses, and restaurants lay in close proximity, with some able to host large events for hundreds of people. It was also one of the friendliest towns around, one of those special places that kept visitors talking long after the visit. Or coming back. Between us, we've probably been to Garmisch a half-dozen times. This travelogue is a mixed-bag of snippets from several trips, but much of it was drawn on the one time Tom went in the summertime one year. It was the year-round nature of Garmisch-Partenkirchen that made it so successful -- skiing thoroughout the winter, hiking and places to visit in the summer. Garmisch's train station connected Deutsche Bahn travelers with several trains and gondola rides leading to the area's many ski resorts. The most notable of these was the Zugspitze, the highest point in Germany that was also a major ski area. In summer, visitors were only minutes away from a whole host of major attractions -- including the great Linderhof palace once owned by the infamous King Ludwig II of Bavaria, the town of Oberammergau that hosts the Passion Play every ten years, the town of Ettal with its famous monastery, and the classical music destination of Mittenwald near the Austrian border. An hour's drive away took one to Neuschwanstein, Ludwig's most famous castle, or to the city of Innsbruck in Austria where the Olympics were twice held. 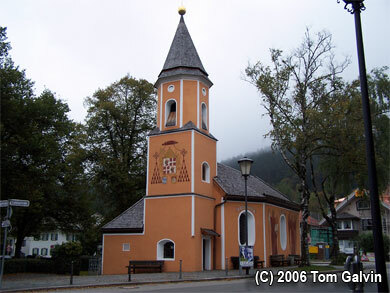 Speaking of the Olympics, Garmisch-Partenkirchen also hosted the Winter Games, in 1936. First, we'll present the Garmisch side. The town of Garmisch was very much like a regular town, with more of the eve ryday shopping interspersed with a dazzling array of muraled buildings, churches, and theaters. Its main street was about a half-mile long, bounded by a marvelous restaurant square (the Marienplatz) with the Pfarrkirche St. Martin and traditional Bavarian restaurants on one end and the town's Kurhaus theater (see second photograph) on the other. All along the way, the Alpine foothills served as a backdrop. The restaurants, and their traditional cuisine, were noteworthy. Many espouse a hunting theme, as this region was a popular destination for hunters. The interior designs often included the stuffed heads or skulls of deer, and venison (hirsch) was often available as a menu item, usually as a venison stew or hirschgoulash. A particularly common sight was that of a deer skull with a cross between its antlers, referring to the vision that St. Hubertus had centuries ago when he saw a deer with a crucifix glowing over its head. (By the way, that also served as the symbol for the famed German herbal drink, Jaegermeister.) Each year at the beginning of hunting season, the Catholic churches in the region hosted a Mass in honor of St. Hubertus and as a way of wishing the best for the area's hunters. 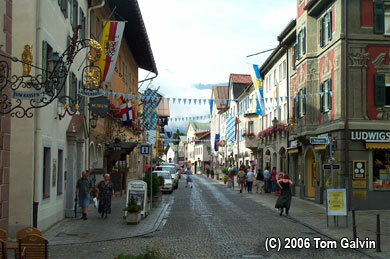 Partenkirchen, on the other hand, put on a more festive appearance. It had its own great downtown strip, which is shown in the fourth photograph. The places along this street were wonderfully flowing with flags and decor. Each individual building had its own photo-worthy moment, but we chose a favorite (the Gasthaus Zum Rassen) to feature in the fifth photograph. 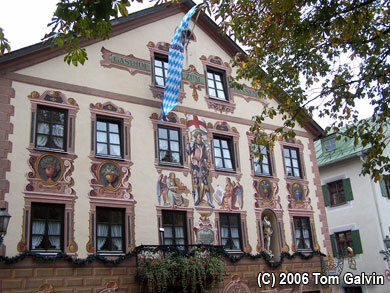 That particular Gasthaus brought back memories for Tom, who during his first-ever visit to Garmisch participated in a special Bavarian night held in the back room with three hundred of his closest friends. The room had long tables, waitresses in traditional dress, beer by the liter, and Bavarian musicians to provide the atmosphere. But this was only one of several places capable of hosting such rousing events. 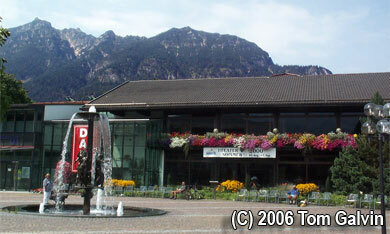 For those curious about Garmisch's Olympic past, the old Olympic venues were still in use. But naturally, given that they held the Games when winter sports were not widely followed on the Winter stage, the venues were far from impressive compared to those of, say, Salt Lake 2002. Still, the ski jumping venue is used to this very day as part of the international circuit, the ice rink hosts the local hockey team, and the Germans often host their Olympic trial events there. Certainly, there's little chance of tiny Garmisch being the host city again, but if Munich were to pursue the honor, Garmisch would probably handle the Alpine events. As for biking and hiking in the summer, the region was a perfect destination. Bike trails through the forests and surrounding villages are plentiful. There were also a number of nearby lakes with bike trails to go riding with a picnic lunch. It was a wonderful way to relax. Would there be a downside to all this? Based on personal experience, there were two potential pitfalls. First was getting a room. The summer and winter months usually found the guesthouses booked solid a year in advance, although there were so many places to stay, we were usually able to find one at the last minute through the Garmisch-Partenkirchen website, one of the best town websites we had encountered for tourists. The second potential pitfall was the weather during the spring and fall. It can tend to get very foggy, which not only removed much of the beautiful surroundings from view, it made for absolutely treacherous driving. The road to Oberammergau and Ettal was a very windy and steep climb up a mountainside, which in dense fog needed to be done very carefully. Stick with the summer or winter, if possible. 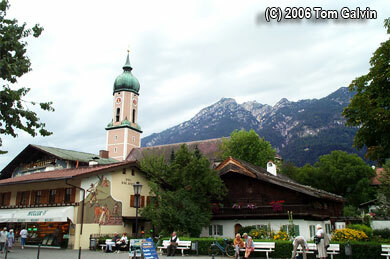 The dual-town of Garmisch-Partenkirchen was dually-wonderful, one of the most inviting towns in Europe. The beauty of the towns were only surpassed by the natural beauty of surroundings. You ought to check it out.